The Recreational Vehicle Industry Association (RIVA) represents about 400 North American manufacturers and component suppliers. Its members manufacture about 98% of the rv's built in the USA. The association, along with rv dealers & campground operators, are the people behind the successful Go RVing campaign, designed to convince all of us we need to be rv owners. In that they've apparently been doing a good job. The association also does important work in promoting standards in the rv industry -- with most North American rv's having a RVIA compliance sticker confirming they were built to RVIA standards. The association are also active lobbyists working to keep the business & regulatory climate in the USA conducive to its member's needs. Those needs are to keep selling rv's and grow the industry. With the economy struggling, high unemployment numbers, etc. it has must be an uphill battle to get people spending any money. 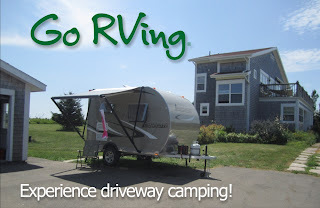 Where the Go RVing campaign has succeeded is in selling the "escape". Based on consumer research, RVing is promoted as a way to have authentic experiences. Enjoying a beautiful sunset, a scenic lake, a mountain vista, or a spectacular star-filled night sky are simple pleasures -- apparently available to everyone who has an rv. Of course most of us know you can in fact experience such things without an rv. Where the rv helps is with convenience. Any of us could go out into the desert to see those stars but it sure is easier to imagine actually doing it with a cozy rv to sleep in. The trend is to increased level of rv ownership. Currently the level is pegged at 8.5% of American households having an rv. The level in Canada is 14%. In both countries the numbers are increasing. The fastest growing demographics are baby-boomers / empty-nesters and younger singles & couples under the age 35. Seeing their country is the top priority of 90% of RVers. With one-in-five American (20% !!!) households currently interested in buying an rv it is an optomistic time for rv manufacturers. That wide interest tells manufacturers they need to match products to increasingly diverse groups of potential purchasers. In response to that trend manufacturers are offering more models and more options. This supports the trend of buyers being interested in having their new rv's personalized to their particular needs. There is also a trend that smaller, more economical, models are gaining popularity. The associated trend is the interest in better use of space over having more but less-functional space. The trend towards lighter weight construction & greener materials is gaining momentum. It relates to concerns about fuel mileage, applicable to both moterhomes & towed rv's, and the broader trend of the goal to be 'greener' and have more sustainable, healthier, lifestyles. In addition to responding to those trends with new floorplans, more options, and lighter construction systems, manufacturers are recognizing the needs of parcticular groups of buyers such as full-timers. There is a trend towards offering models marketed towards them with features like deeper slides, and larger kitchens & baths. I think you're the way of the future. Small, LITEWEIGHT, easily towed is what people are starting to have an interest in. I have been looking at Livin Lite's pop-up campers myself to pull with my Jeep Patriot. What do you tow with? Hi! I hope you do join the trend and get yourself a QuickSilver camper! We have a Jeep Grand Cherokee with a 3.7-litre V6 and auto transmission. It had a factory tow package including a transmission cooler but I had to replace the factory hitch with a more robust one. In normal driving at speeds up to 60-mph you'd hardly know the trailer is there. Zero sway with our Equal-i-zer hitch and very good breaking. Over 60 and big hills requires considerably more effort from the drive-train. Bringing the trailer home from Indiana I kept up with high speed traffic on the interstates & Ontario's highway 401. I think I was being too hard on the Jeep. I've since learned it is so much more comfortable driving a steady 60 mph. It is less stressful on driver, passenger(s), and the Jeep.